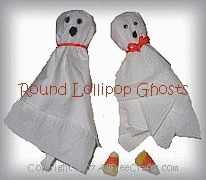 Use Tooties Roll Pops, or other round, sucker style lollipops, as the base for tissue paper ghosts for Halloween. They are easy enough for children to craft themselves, make great hand-outs for trick-or-treaters or party favors, and are just the thing if you’re looking for an inexpensive group activity to make Halloween decorations. 1. Place a tissue down flat on your work surface. If using two tissues, lay the second one on top of the first on an angle, so that the corners of both tissues can all be seen. 2. Place your round lollipop in the middle of the tissues and gently gather the tissues around the head of the lollipop. 3. Tie a small piece of yarn or thin ribbon just below the head of the lollipop to make the ghost’s head. You can make a bow with the yarn if you wish, or just tie it and cut off the long ends. 4. If using plastic eyes, add a dab of glue to the back of eye and gently press into place. If you prefer to draw all the facial features, just use a black marker to dab on two circle eyes and a larger circle shape for the mouth. 5. Hang as decorations, or stack in a big bowl to give out on Halloween night.